The NZ Herald published my article outlining the problems for farmers and New Zealand in the use of the scientifically unsound carbon unit. Two reports, one by the Parliamentary Commissioner for the Environment, Dr Jan Wright, the other by Motu Economic and Public Policy Research, have confirmed methane produced at a constant rate, which is pretty much all the methane New Zealand farmers produce, is not responsible for global warming. The reports vindicate the farmers and campaigners who have long fought against politicians and environmentalists who have claimed all methane emissions are causing global warming. What the parliamentary commissioner and Motu confirmed is that methane emissions are short lived in the atmosphere and cyclical, and when produced at a constant rate do not cause the atmospheric concentration of methane to increase. Hence Motu concluded emissions of methane do not have to decrease at all to stabilise the atmosphere, they simply have to stop increasing. This is in contrast to fossil sourced CO2 emissions which are not cyclical but additive and last in the atmosphere for hundreds of years. Stopping the increase in CO2 emissions will not stabilise the atmosphere as is the case with methane. The obvious scientific response to increasing atmospheric greenhouse gas is to stop methane emissions increasing and to reduce CO2 emissions. Our Government’s policy response to climate change will not achieve this because the politicians have run ahead of the science and signed global treaties and adopted internal climate change policies that are based on a carbon accounting system that is not scientifically sound. The system our Government relies on, as does the Paris climate agreement, is the system of carbon accounting where the different greenhouse gases are quantified in one theoretical unit they call carbon, which stands for carbon dioxide equivalent. The big problem with this system is that it does not distinguish between greenhouse gas emissions which increase the concentration of atmospheric greenhouse gas and those which do not, such as methane emissions in constant flow. This is a fatal omission because it results in a silly system where the environmental impact of a carbon emission cannot be known unless the source of the carbon is known. New Zealand’s commitment in the Paris agreement is to reduce carbon emissions but no one cares which carbon emissions we reduce, so the environmental impact of any reduction cannot be known. The commitment is a nonsense and therefore so is the Paris agreement. Carbon is supposed to be the global warming industry’s way to equate a number of different greenhouse gases based on their global warming impact, but when one carbon unit is not the same as another, assigning carbon values to different greenhouse gases is a pointless exercise. The parliamentary commissioner outlined the flaws in the carbon dioxide equivalence system but failed to draw the inescapable conclusion that carbon is a nonsense. It is as if she failed to realise the significance of her own findings. It is not possible for Dr Wright to state some carbon emissions need to reduce to zero and others don’t need to reduce at all, without concluding that carbon is a nonsensical thing. Its only purpose is to be a common greenhouse gas currency and it fails. Dumping the carbon unit and accounting for each greenhouse gas individually would result in a regime that reflects what is happening in the atmosphere. It would allow for a targeted and intelligent response that was optimal for each gas. 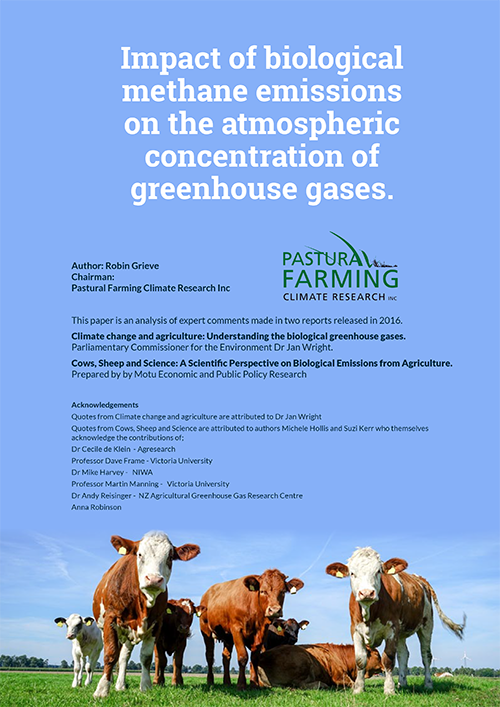 Methane emissions cannot be ignored totally because they could be a factor in global warming theory, as a product of an increase in livestock output. Methane emissions have only increased by 5 per cent since 1990 despite massive increases in agricultural output, because farmers are already making emission intensity gains. Slowing or stopping the increase in methane emissions will not be as challenging as reducing CO2 emissions to zero. The Government’s energy should not be diverted towards unnecessary reductions in methane emissions. New Zealand is severely disadvantaged under a system where 35 per cent of our carbon emissions are sourced from methane and are mostly harmless. Treating each greenhouse gas individually will stop the unfair victimisation of our farmers and of us as a country. Once you remove 35 per cent of these carbon emissions from the equation our per capita emissions of real greenhouse gas is about half that of our Australian neighbours. Replacing the current carbon accounting system with one of environmental integrity will give us a system that recognises our true environmental footprint and a true pathway forward.